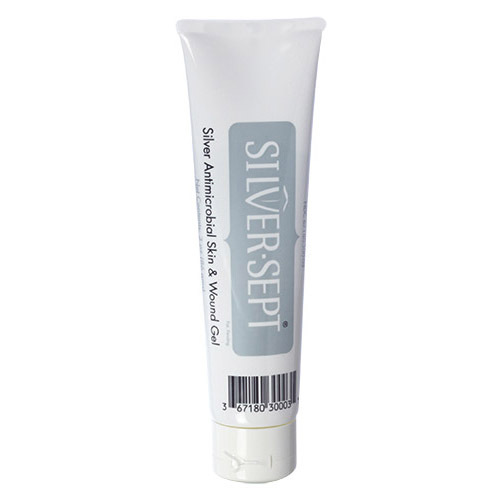 Silver-Sept Silver Antimicrobial Skin & Wound Gel, containing 200μg/gram total silver, is a clear, amorphous hydrogel wound dressing that helps to maintain a moist wound environment that is conducive to healing. Silver-Sept will not stain or discolor tissue. Silver-Sept Gel functions as a long-lasting antimicrobial barrier by inhibiting the growth of common bacteria such as: Staphylococcus aureus, Pseudomonas aeruginosa, Escherichia coli, Proteus mirabilis, Serratia marcescens, including the antibiotic resistant strains: MRSA & VRE, as well as fungi such as, Candida albicans and Aspergillus niger.